A private manned Mars mission won't get off the ground as planned in January 2018 unless it secures the support of the federal government within the next few months, officials say. The nonprofit Inspiration Mars Foundation aims to partner with NASA to send two astronauts on a flyby mission to the Red Planet in 2018. Inspiration Mars has little chance of making this launch date unless it receives assurances very soon from Congress and the White House that the mission will be a NASA priority, officials said. 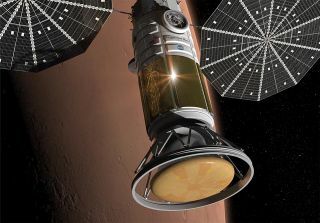 This image from an Inspiration Mars fact sheet shows the nonprofit space exploration group's vision for its planned two-person Mars flyby mission, which it hopes to launch between 2017 and 2018. Inspiration Mars' "Mission for America" would launch a married couple on a 501-day flyby mission to the Red Planet in January 2018. The astronauts would not land on Mars, but would streak within 100 miles (160 kilometers) of its surface before beginning the long trek back to Earth. The mission would lay the foundation for even more ambitious exploration efforts in the future and help cement the United States' status as a global leader in science and technology by inspiring the next generation of researchers and engineers, Inspiration Mars officials say. "If we don't have ways to create heroes for our children and inspire people into the sciences, I think America loses its global competitive edge," Inspiration Mars chief technology officer Taber MacCallum said during Wednesday's telecon. On Wednesday, Inspiration Mars revealed that it aims to rely heavily on NASA equipment and expertise to pull off the ambitious mission. The flyby would require one liftoff of the agency's giant Space Launch System rocket, for example, and the two astronauts would return to Earth in a re-entry vehicle based heavily on NASA's Orion crew capsule. Indeed, NASA would pretty much take the reins of the project, MacCallum said. "The way we're proposing this, this is a NASA mission with a philanthropic partner contributing to the mission," he said. The flyby mission will likely cost less than $1 billion, Tito said. While the federal government would have to supply a healthy chunk of the funding — several hundred million dollars of new federal spending may be required — the Inspiration Mars Foundation would contribute as well. The multimilllionaire Tito has bankrolled the mission thus far. But Inspiration Mars cannot begin fundraising without assurances that the Mission for America is a NASA priority, and that news has to come from Congress and the White House, Tito said. "We can't raise money from other donors, and I wouldn't even crowdfund – even from small donors — until we can legitimately say there is a mission on the books," Tito said. "And there isn't a mission on the books. We're trying to make that happen." With this uncertainty in mind, Tito and his colleagues are mapping out a contingency plan to get off the ground in late 2021. A mission launched in that year would feature a Venus flyby as well as a close look at Mars, though it would require 80 additional days in space, Tito said. "I think this mission is going to fly one way or another by, at the latest, 2021," he said.